Ferenc Maté writes like a really sane, happy friend who knows how to enjoy life. He points out, in his conversational style, that our obsession with goods and gadgets have led us to neglect true and lasting joys: our health, creativity, self-reflection, and, most important, the time we spend with one another. 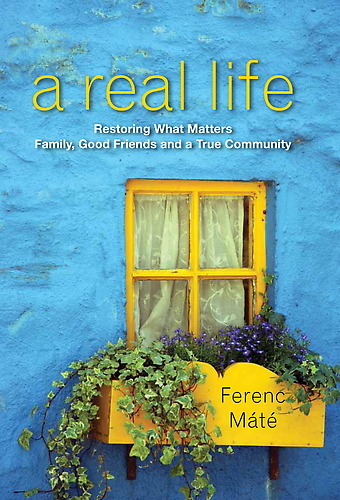 In A Real Life, Ferenc Maté’s impassioned, humorous voice challenges us to rethink the meaning of “success” and reevaluate how we live, work, eat, play, love, and raise our children. Why do we live the way we do? Why do we strive? For what? For whom?... The solution to a better life involves no hardship: all we need to do is lead a better life. This simply means doing work that offers true pleasure and security; eating and playing in a way that yields health and sensory gratification, and having relationships that bring us joy, trust, loyalty and satisfaction. His eye-opening observations and startling truths remind us of the forgotten pride and joy of independence, self-sufficiency, neighborliness, friendship, working with our hands, natural benefits of physical labor, and irreplaceable rewards of face-to-face human contact. His book will not only reinvigorate even the most disillusioned but also convince the most technology-obsessed to give the mall and gadgets a rest and get a real life. How Do You Hug an Electronic Friend? With his wife and son, Ferenc works the Maté vineyards surrounding the 13th century friary they restored in Italy. Word is they make one of the world’s best Brunello wines.